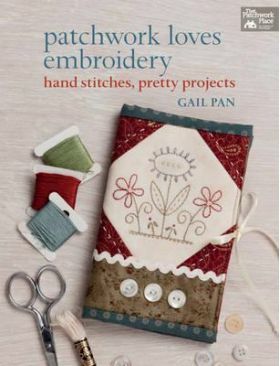 This is a wonderful collection of patchwork and hand-embroidery projects that quilters and crafters everywhere will love. Quilters, crafters, and embroiderers of all skill levels will be thrilled with these whimsical patterns from Australian designer Gail Pan. Featuring full-sized hand-embroidery designs, Patchwork Loves Embroidery is for anyone who wants to enjoy the relaxing hobby of putting needle to thread. You can choose from 15 projects, including wall hangings, table runners, totes, and fabric covers for books or folders. You can quickly learn the basics: using the correct needle, choosing threads & fabrics, and transferring the designs. You can embellish projects with sweet, garden-inspired motifs ranging from charming little birds to beautiful flowers, fanciful cottages, and more.